Like scones? Then you’ll love these almond-crumb delights! 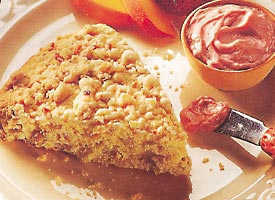 They bake with a sweet, buttery almond streusel topping. Cut butter into remaining ingredients until crumbly. Set aside. Cut butter into flour, sugar, baking powder and salt in large bowl, using pastry blender or crisscrossing 2 knives, until mixture looks like fine crumbs. Stir in almonds. Stir in egg and just enough half-and-half so dough leaves side of bowl and forms a ball. Turn dough onto lightly floured surface; gently roll in flour to coat. Knead lightly 10 times. Pat or roll into 9-inch circle on ungreased cookie sheet. Sprinkle with streusel; press lightly into dough. Cut into 8 wedges, but do not separate. Bake about 15 minutes or until golden brown. Immediately remove from cookie sheet; carefully separate wedges. Serve warm. Success Hint: Count to 10! Overkneading the dough will make your scones tough. Tip: To toast almonds or other nuts, heat oven to 350 F and bake in an ungreased baking pan about 10 minutes, stirring occasionally, until golden brown.